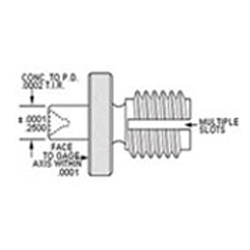 Flexible hole location plug gages also referred to as centerline hole location plugs are used to determine the true centerline to centerline distances of threaded holes. The flexible hole location gage is slotted at 90° increments to ensure positive location on the thread flanks regardless of hole size. This feature provides a firm locating grip without pulling the shoulder of the plug up against the hole face thus avoiding any squareness error being transferred to the centerline measurement. The center is concentric to the threaded section within .0002" TIR for probe location of coordinate measuring machines as well as plate inspection setups as "overpin" measurements. The flexible hole location gage can also be used with vee blocks to check concentricity to other diameters. Thread Check stocks flexible hole location gages in unified and metric sizes. Gage sets are available. Thread Check’s expert sales engineers can assist you with selecting the correct gages for your application. The .2500 +/- .0001(6.35mm +/- .0025mm) shank is concentric to the threaded section within .0002 T.I.R. prior to slotting and may be used with micrometers or plate inspection setups as "overpin" measurement. Sizes #10 (M5 Metric) and smaller are solid tapered thread form from low limit to high limit of class 2B pitch diameters.